You'll be £25.00 closer to your next £10.00 credit when you purchase U-Boat Assault on America. What's this? The Second Happy Time was the informal name given to that phase of the battle of the Atlantic when German U-boats attacked both merchant and US naval vessels along the American East Coat with impunity and inflicted massive losses. With tankers burning and petrol rationing in New York City, the US Navy seemed powerless to stop the deprivations of Hitler's marauding U-boats. Some referred to this episode as America's second Pearl Harbor. This new book seeks to explain how America responded to these deadly assaults and looks at the steps that the Navy Department took to train the men, harness the scientists and make the organisational changes that were required to defeat the German threat. A major focus will be on how the naval bureaucracy evolved in the face of the stresses of war. As well as looking at the ships and men who fought the battles at sea, the author explains the significance of the port of New York and its vulnerability to sabotage by pro-Nazi elements; he also explores the relationship between the US Navy and the New York Mafia. The influence of the major players is analysed, including Rear Admiral Adolphus Andrews, the sexagenarian commander of the Eastern Sea Frontier; Fleet Admiral Ernest J King, Chief of Naval Operations, trying to balance global demands with a devastated navy; and Fiorallo La Guardia, the bombastic Mayor of New York. These are useful books which invite our attention. 1942 the Germans thought it was ‘happy hour’ as the US newly entered into WWII seemed powerless to protect its merchant shipping from German submarines. 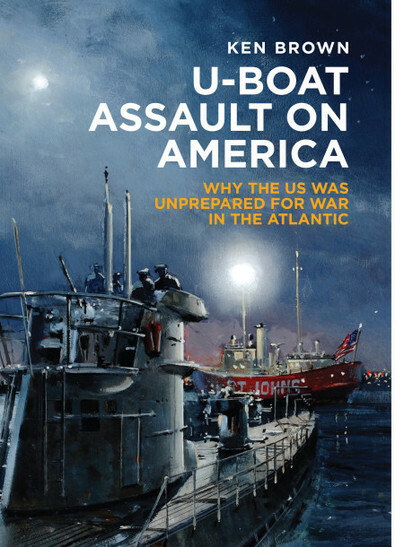 This new book looks at the US failure to protect its merchant ships during the first months after joining Britain in the war against the Nazi – Very Highly Recommended. Interesting and carefully researched,sources are acknowledged and there is a good index as well as an illustrated section with high-quality black and white photographs. Worth a look, especially for those coming to the story for the first time. KEN BROWN has had a long fascination with naval history and has been conducting research on U-boats off the East Coast of America for more than three years. He has had articles published in World at War Magazine on unrestricted submarine warfare by the United States in WWII, and on the loss of SS Normandie. He lives in New York and this is his first book.